To borrow a phrase from the 1994 movie Forrest Gump, an old photo album is a lot like a box of chocolates: you never know what you’re going to get. That was certainly the case with a very old leather-bound album we recently acquired from a collector in Ohio. In it we found the first known photograph of great-great-great grandmother, Christiana (Schlagel) Krosch. The album was purchased from the same source who provided us the carte de visite image of Philipp Treutel. Based on his inclusion in the album, we surmised that the other photos would be related to the family tree of my grandmother, Ruby (Treutel) Hanneman. One of the first carte de visite photos we pulled from the album was labeled, “Grand Mother Krosch, Our Mother’s Mother.” It was right next to a photo of Henrietta (Krosch) Treutel. Since Henrietta was the only girl in the Krosch family of six children, it was an easy jump to conclude the photo showed her mother, the former Johanna Christiana Schlagel (1801-1884). Christiana (Schlagel) Krosch in an undated photograph. The portrait could have been taken the same day as that of her daughter, Henrietta, shown at the bottom of this article. The carpeting and staging of the studio are identical. The photograph is the first image in our collection that goes back five generations. It was taken at the studio of F.D. Faulkner in Waukesha, Wisconsin. There are a number of other unlabeled photos in the album that could also be Christiana Krosch. We laid the photos side-by-side in Adobe Photoshop, and even overlaid a low-opacity version of Christiana’s head and face on the other images. The facial contours, distance between the eyes, etc., are remarkably similar. Could the other photos show Christiana later in life? The beady pupils in the right two photos were likely drawn in by the photographer. Could these photographs show the same woman? If she is the woman in the far right image in the series, then we have an ever bigger discovery. That image was taken from a portrait of an elderly man and woman. The portrait was from the studios of F.L. 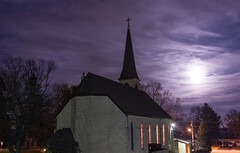 and A.M. Bishop, who had locations in Mukwonago and Waterford, Wisconsin. 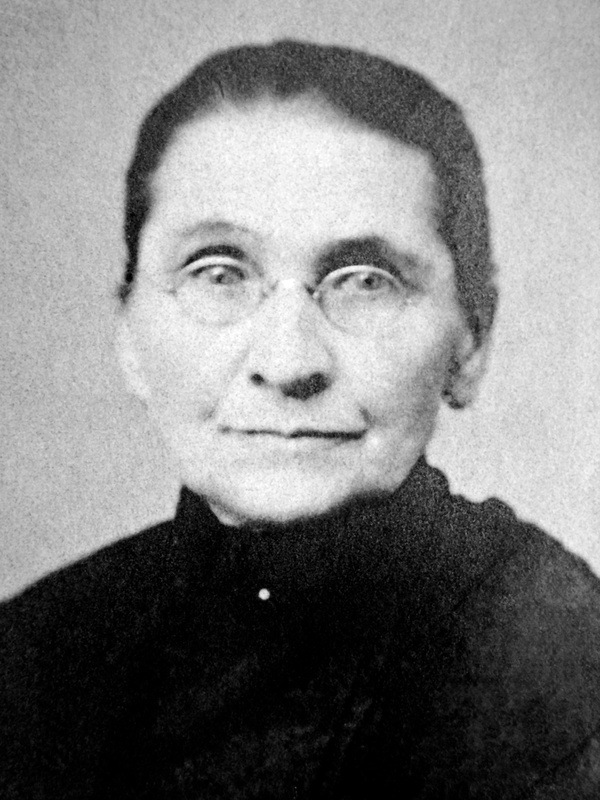 Christiana and her husband John Frederick Krosch settled on a farm just north of Mukwonago after emigrating from Saxony in 1854. Based on visual comparisons, that portrait could show Frederick and Christiana Krosch. We have no images of Frederick Krosch for comparison. He died in August 1876. 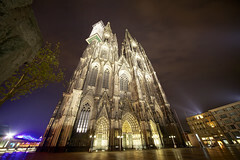 Frederick and Christiana were married on May 10, 1824 at a Lutheran church in Salzwedel, Saxony, Prussia (now Germany). They had six children between 1824 and 1842. Their second youngest was Caroline Wilhelmine Henriette Krosch (born in January 1839), who was called Henrietta. 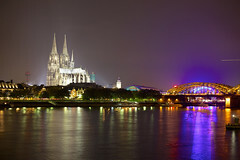 According to Lutheran church records, she was baptized on January 13, 1839 in the parish at Gössnitz. We have unsourced information that she was born at Merseburg, Germany, which is not far from Gössnitz. This information conflicts our earlier belief that the family came from Jessnitz, Prussia. Many Prussian villages had very similar names, which can lead to confusion in genealogy research. More work is needed on where the family lived in Prussia. As documented in an earlier article, the Krosch family left Germany in June 1854 for America. Theirs was a perilous journey aboard the Barque Bertha, which encountered terrible storms and stiff trade winds that delayed arrival in New York by one week. After 40 days at sea, they reached New York, set out for Chicago and Milwaukee, and eventually reached East Troy in Walworth County. Frederick took to farming on an 80-acre plat north of Mukwonago. After Frederick Krosch’s death, Christiana moved to Minnesota to live with her son, William Frederick Krosch. She died in December 1884 and is buried at the Dobson Schoolhouse Cemetery in Elmore. Henrietta Krosch married Philipp Treutel sometime in the late 1850s. Philipp established a blacksmith shop at Mukwonago, but he also worked as a blacksmith in Milwaukee during the 1860s. The couple had seven children between 1859 and 1879. Their youngest, Walter Treutel, became father to our grandmother, Ruby Viola (Treutel) Hanneman. The newly acquired photo album also had a carte de visite of Henrietta at a much younger age than the other two photos of her in our collection. Family Line: Frederick and Christiana Krosch >> Henrietta (Krosch) Treutel >> Walter Treutel >> Ruby V. (Treutel) Hanneman >> Donn, David and Lavonne Hanneman. Some of the earliest documentation of a Hanneman-Treutel relative in America — dated 1855 — has been discovered in the archives of the Walworth County, Wisconsin Circuit Court. 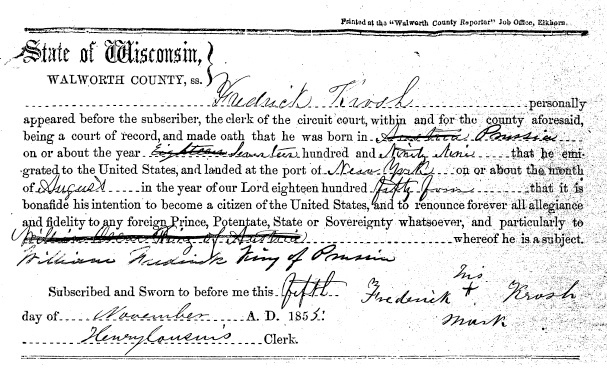 John Frederick Krosch, just a year from stepping off the boat from Saxony, filed his declaration of intent to become a United States citizen on November 5, 1855 before the county court in Elkhorn, Wisconsin. Krosch made the declaration on behalf of himself and his wife, Christiana. The declaration document says Krosch intended to become a U.S. citizen and that he “renounced forever all allegiance and fidelity to any foreign prince, potentate, state or sovereignty whatsoever, and particularly to William Frederick, King of Prussia.” The document was found in the court archives, held at the Area Research Center at the University of Wisconsin-Whitewater. 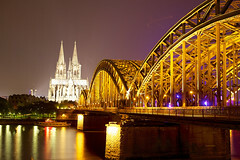 Johann Friedrich Krosch was born in 1799 in the Kingdom of Saxony, which today is part of Germany. In 1854, he brought his wife Christiana and children Charles, Augustus, Reinhold, Henrietta (grandmother of Ruby V. Treutel Hanneman) and Gustave to America. 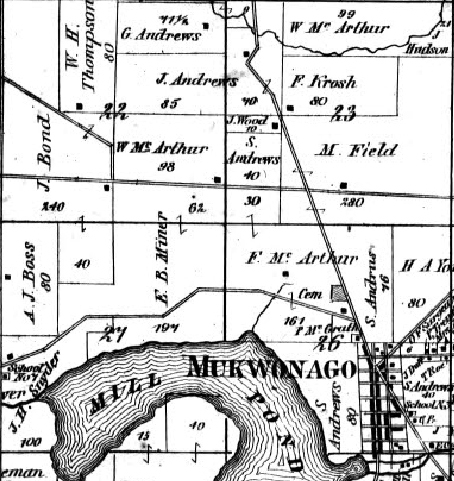 Frederick Krosch’s farm was in Section 23 on this 1870 Mukwonago-area map. The Krosch family landed at New York on July 21, 1854 and headed for Milwaukee. The eldest boys established farms at Lake Beulah near East Troy in Walworth County. 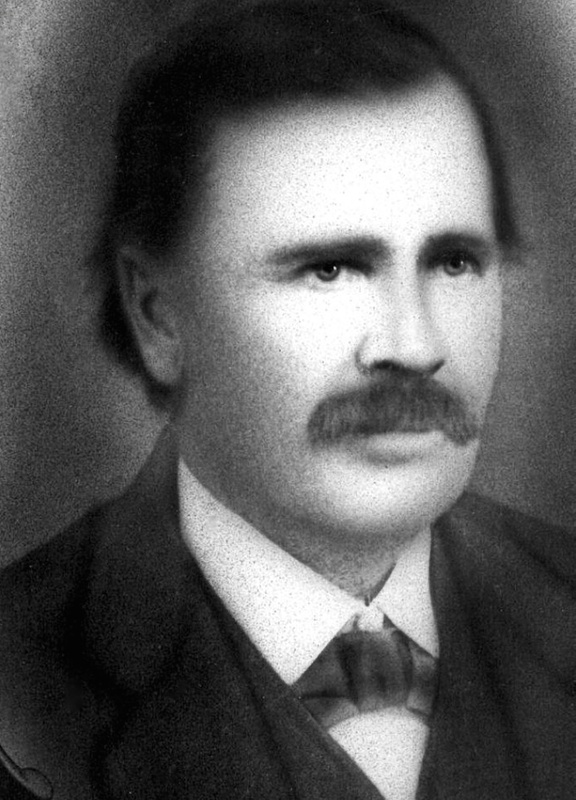 John Frederick Krosch may have initially lived in Walworth County to help his boys get their farms started, considering that he filed his citizenship declaration in Walworth County. 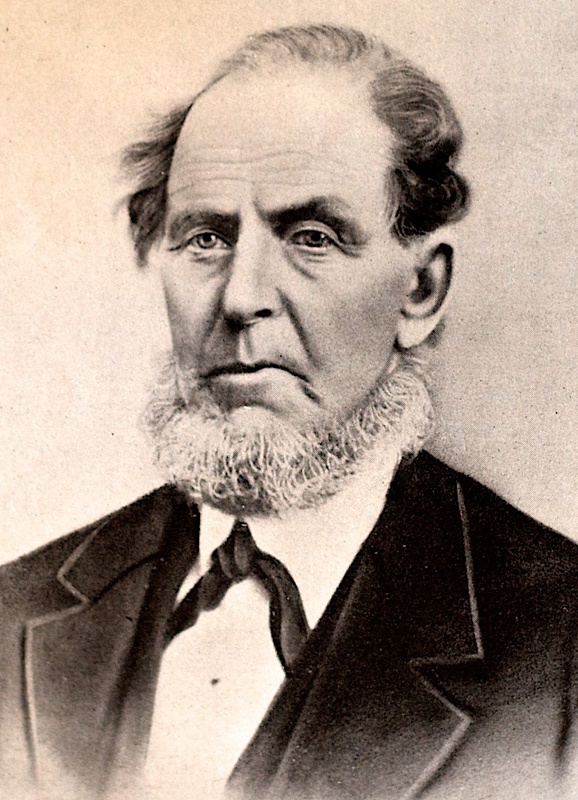 By 1860, the elder Krosch had his own farm near Mukwonago in nearby Waukesha County. The 1860 U.S. Census lists the youngest Krosch boys, Reinhold and Gustave, as laborers on their father’s 80-acre farm. Plat records from 1873 show the Krosch farm in Section 23 of the Town of Mukwonago, just a few miles from where his daughter Henrietta Treutel lived with her husband, Philipp Treutel. Krosch farmed at Mukwonago for more than a decade. We don’t know much about his later years. 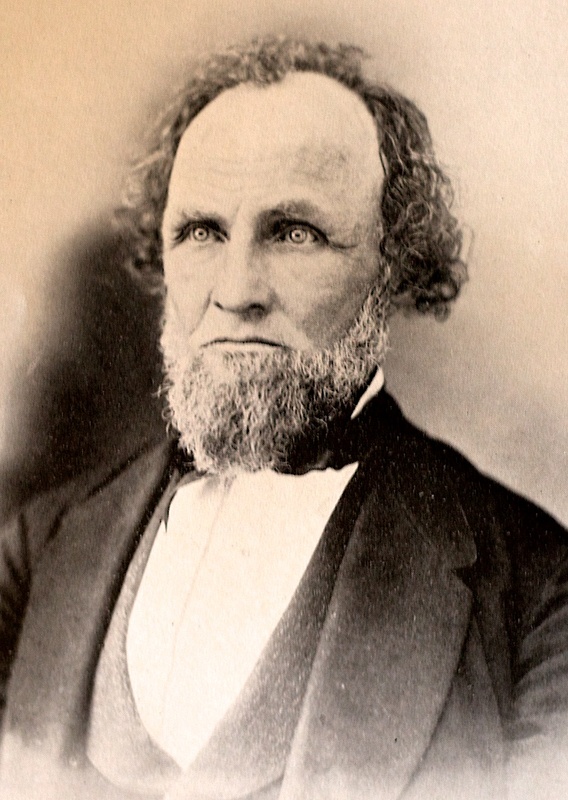 He died on August 7, 1876 at age 77. He is buried among the settlers of Mukwonago at Oak Knoll Cemetery, a short distance from where his farm once stood. 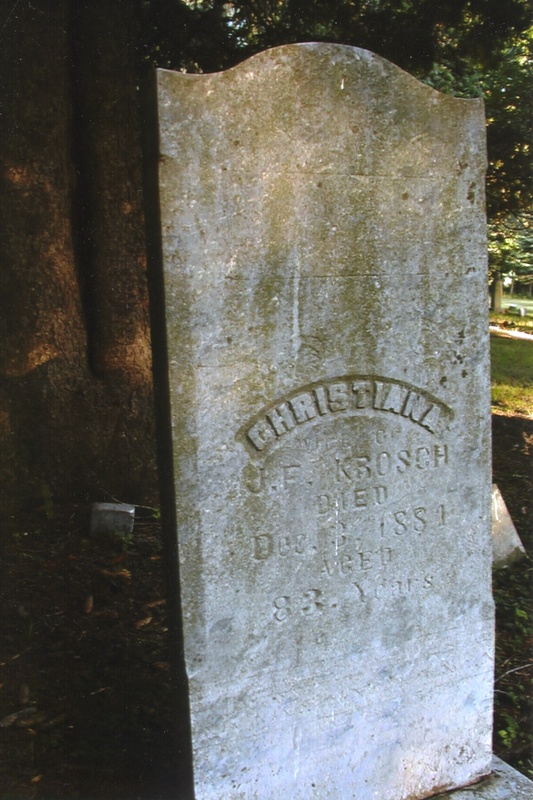 The grave of Christiana (Schlagel) Krosch at Elmore, Minnesota. His wife Christiana (Schlagel) Krosch moved to Elmore, Minnesota after being widowed. The 1880 U.S. Census lists her living on the farm of her son, William F. Krosch. She died on December 3, 1884. She is buried near three grandchildren at Dobson Schoolhouse Cemetery in Elmore. FAMILY LINE: John Frederick Krosch >> Henrietta (Krosch) Treutel >> Walter Treutel >> Ruby (Treutel) Hanneman >> Donn, David and Lavonne Hanneman. 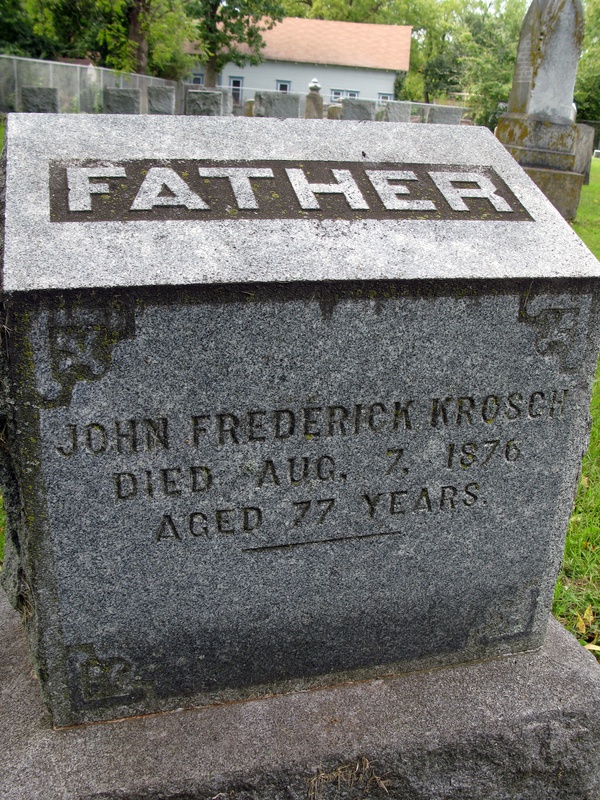 John Frederick Krosch’s grave at Oak Knoll Cemetery in Mukwonago, Wisconsin. It would be hard not to respect a man who worked diligently at his job six days a week for 30 years. For Walter Treutel, the job record was even more impressive. His career as a rural letter carrier took him on a nearly 240,000-mile journey making sure the people of Vesper, Wisconsin received their mail and packages from 1904 to 1934. Walter Treutel of Vesper, Wisconsin. “The new rural mail carriers who will begin carrying mail on the 10 new routes on December 1st received their appointment from Washington last week,” the local Grand Rapids, Wis., newspaper announced in November 1904. “These carriers all took the competitive examination in this city four weeks ago and those fortunate to receive an appointment will now only have to file their bond for the faithful performance of their duty.” Walter’s first day as a letter carrier was Dec. 1, 1904. He was just two years married to the former Mary Ladick, and their firstborn child, Ruby, was just six months old. His first trip over Rural Route 1 was made in an open buggy pulled by two ponies. He and his sister, Emma Carlin, rode that first 26.5-mile run together to deliver just 35 pieces of mail. At the time, the Vesper postal station was located inside the Treutel Bros. store, run by Walter’s brothers, Charles and Henry Treutel. Walter’s official postal substitute was his wife, Mary. 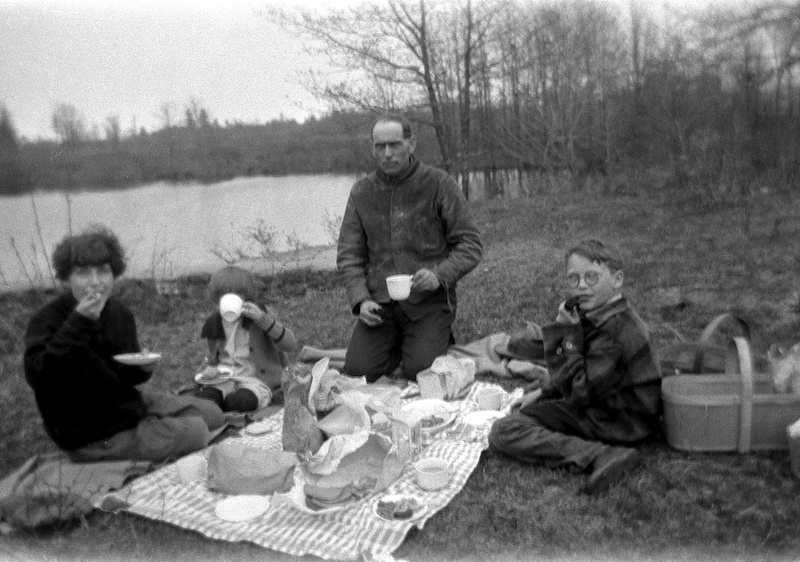 Walter Treutel picnics with children Nina, Elaine and Marvin, circa 1925. Behind the camera is Ruby (Treutel) Hanneman. The dirt roads were rough and filled with chuckholes. The buggy rode over corduroy — soft or swampy sections that were shored up by placing logs across the path. Roads were so punishing in those early days that horses typically lasted only two years in service. The first open postal buggy was eventually replaced by a covered postal wagon. 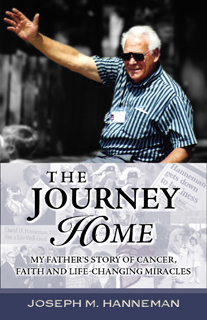 Walter used a dozen horses on his route over the years. One of the toughest, “Old Baldy,” served for seven years in all sorts of weather. 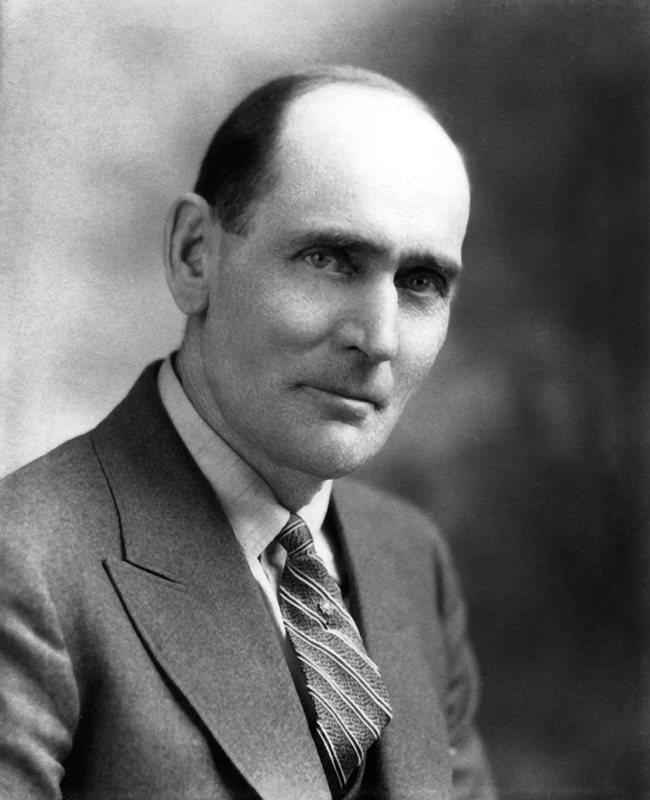 His first automobile, a two-cylinder Buick roadster, was nicknamed “The Little Red Devil.” Three other postal vehicles served on the route during his tenure. He served under five postmasters during his 30 years, including his sister Emma Carlin, who was Vesper postmistress for nine years starting in 1906. In November 1934, Walter took his overdue two-week vacation, then returned for one final route on Dec. 1 — thirty years to the day after his first day on the job. 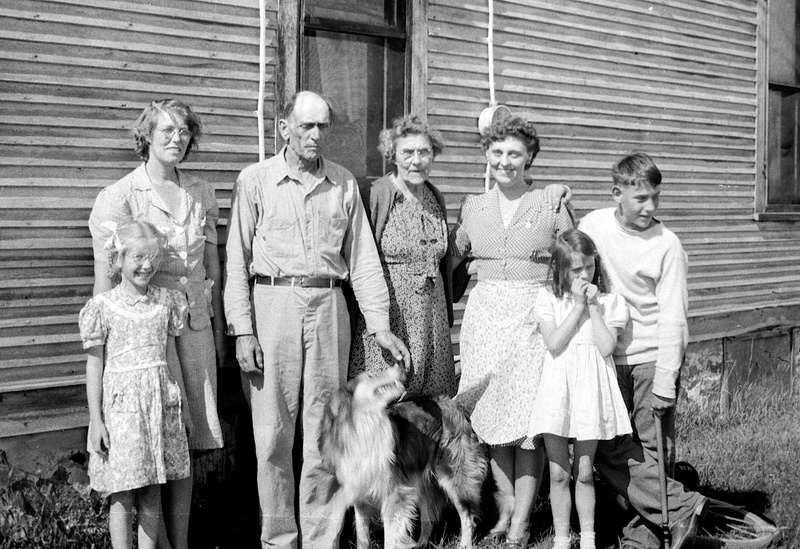 Walter Treutel with second wife Vera (at left), sister Emma Carlin, daughter Ruby Hanneman and grandchildren Lavonne and David D. Hanneman. Walter was born July 23, 1879 in Mukwonago, Wisconsin, the son of Philipp and Henrietta (Krosch) Treutel. Walter’s wife, the former Mary Helen Ladick, died in 1925 after suffering a post-operative infection. She was just 41. They had five children, four of whom (Ruby, Nina, Marvin and Elaine) survived into adulthood. Walter died Feb. 15, 1948 of lingering heart disease. He was 68. 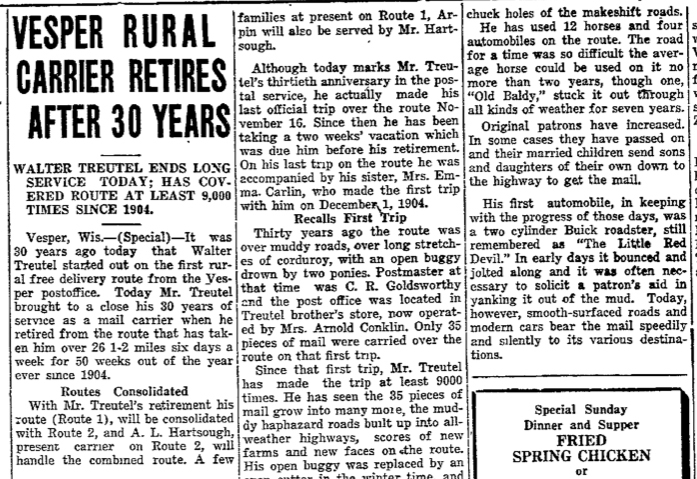 The Wisconsin Rapids Daily Tribune wrote about Walter Treutel’s last day on the job in 1934. FAMILY LINE: Johann Adam Treutel >> Philipp Treutel >> Walter Treutel >> Ruby (Treutel) Hanneman >> Donn, David and Lavonne Hanneman. Like most hard-working farmers of his day, Frederick Krosch spent a lot of time toiling in the fields. First in Germany and then on an 80-acre farm north of the village of Mukwonago in Waukesha County, Wisconsin. It’s amazing to realize that the water bottle he carried with him into the fields has survived to this day, more than 130 years after his death. The glass bottle, embossed with lettering that reads “Dr. Cummins Vegetine,” has been in the possession of Bonnie (Treutel) Young, the elder Krosch’s great-great granddaughter. 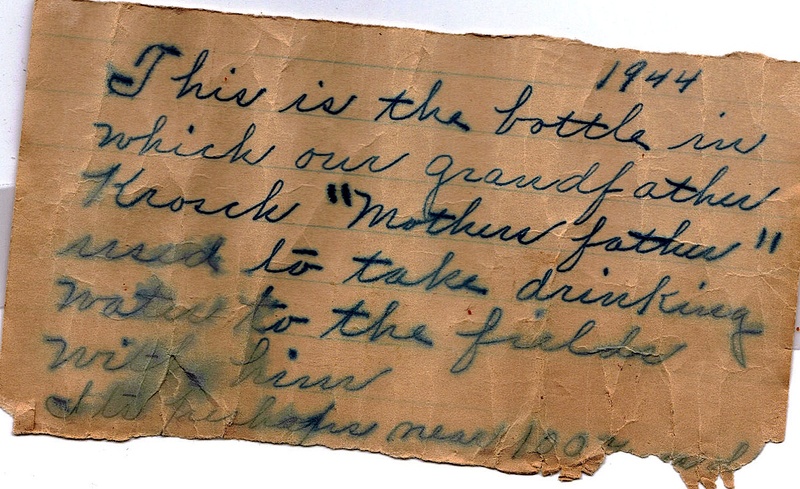 The note was written by Emma (Treutel) Carlin (1877-1962), Frederick Krosch’s granddaughter, who no doubt inherited it from her mother, Henrietta (Krosch) Treutel (1839-1908). As documented in a previous article,the Krosch family came to America inJuly 1854 and settled into farming in Waukesha County. Frederick Krosch farmed 80 acres of land that is now home to a bank and a Culver’s restaurant. The Krosch farm was adjacent to land owned by Judge Martin Field, for whom Field Park in Mukwonago is named. Krosch’s farmland was valued at $1,500,according to the 1870 U.S. Census. Krosch continued his farming as his daughter Henrietta marriedblacksmith Philipp Treutel and started her own family. The elder Krosch died Aug. 7, 1876. He is buried at Oak Knoll Cemetery in Mukwonago. As for the original contents of that bottle, Vegetine was sold for years as a “blood purifier.” It laid claim to curing and preventing maladies from pimples to cancer and neuralgia to “female weakness,” gout and sciatica. Vegetine was made from bark, roots and herbs. Given Vegetine’s wild curative claims, perhaps Frederick Krosch figured out he was better off sticking to water. FAMILY LINE: John Frederick Krosch (1799-1876) >> Henrietta (Krosch) Treutel >> Walter Treutel >> Ruby V. (Treutel) Hanneman >> Donn, David and Lavonne Hanneman. When 16-year-old Henrietta Krosch embarked on a long ship journey from Jessnitz Germany to America, she could not have known that her memory would echo in family history for more than 150 years. When she and her family stepped off the ship Bertha in New York in July 1854, they were headed for Waukesha County, Wisconsin. She would meet a young blacksmith named Philipp Treutel, get married and become mother to many generations. And now we discover her photograph is still a part of living history. Portrait of Henrietta (Krosch) Treutel, taken about 1906 in Nekoosa, Wisconsin. “Henrietta Krosch Treutel. Married to Philipp Treutel. Parents of Lena Treutel Moody (Wm); Lisetta Treutel (Winfield); Henry Treutel (married to Josephine Garlack); Charles (Mary Miller); Oscar; Emma Treutel Carlin (Orville); Walter Treutel (Mary Helen Ladick). The photograph likely dates to between 1901 and 1908. 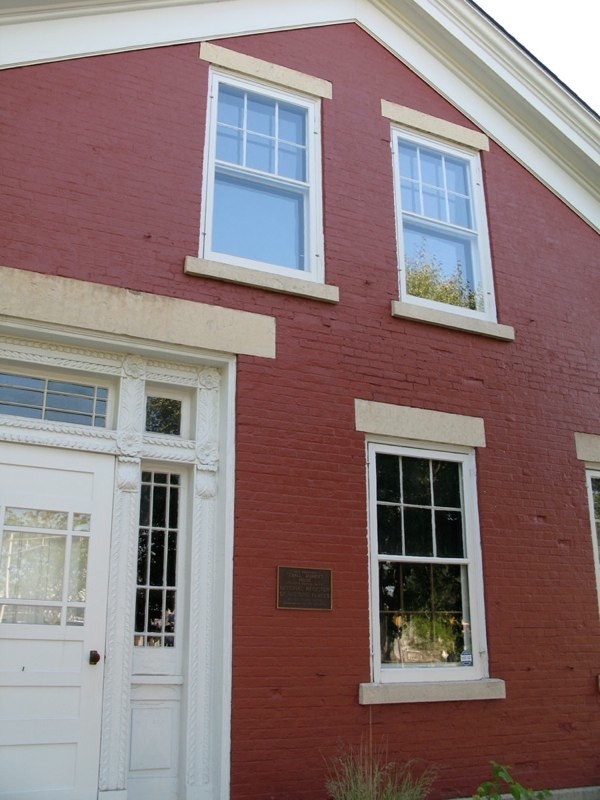 The Treutels moved to Wood County in 1901 and Henrietta died in 1908. The photographer’s imprint on the photo is from Nekoosa in southern Wood County.